Bluetooth OLD came to us in May 2018, having previously been at Hof Kasselmann. Insa Hansen has done a great job training him, with success up to Intermediare I level. He has a fabulous work ethic, reacts to the finest of aids, has plenty of “go”, and especially loves the cavaletti work. 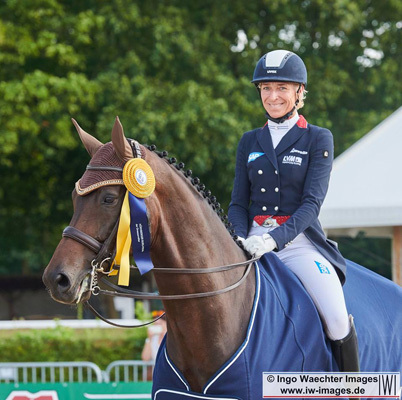 In the short time that he has been with us I have already been able to win at Prix st Georg and Intermediare I.
I’m looking forward to training him further and could qualify him for the Nürnberger Burg Pokal Final.